My family and I will be driving around the USA this summer — east and west coasts, and across the southern coastal states. We'll be doing sightseeing, but I'm also wary of missing a lot of scenery by staying on interstates the whole time. What are some practical ways that I can identify portions of the country where it would be worthwhile to get off the interstate and take state routes? I'm sure each small town tourist department will recommend that I drive slowly by their businesses, but on a nation-wide trip, how can I find the most scenic routes? I would take a look at a site called Roadtrippers. It has exactly what you are looking for. They have article like "The ultimate road trip guide to I-90, from Boston to Seattle" and a whole bunch of different information about traveling not only in the US, but places all over the world. Also, if you just google the interstate you will be on and add "tourist attractions" you will get a host of great information. The American Automobile Association (AAA) publishes many paper road maps and travel guides for its members. Their recommendations for particularly scenic routes are annotated by a dotted green line. 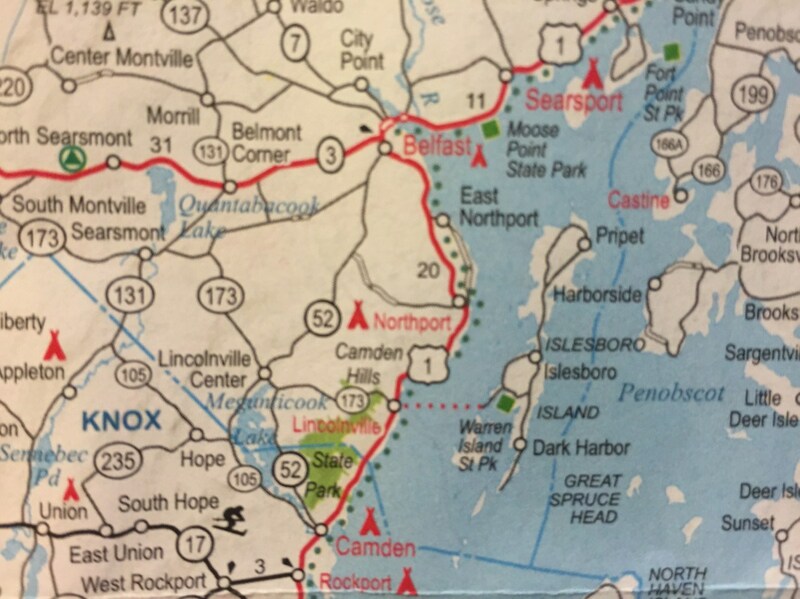 For example, in the map below, US-1 along the coast of Maine is denoted as particularly scenic. AAA does not sell its maps commercially as far as I can tell (though an Amazon search turns up some resellers); instead, they are provided free to AAA members. If you're already a AAA member, this might be a useful resource for you to tap. America's Scenic Byways is a one-stop shop for scenic routes in the US. These are shown on a US map and also listed in text. The map makes it easy to find roads in or near areas you will be traveling through. The site includes National Scenic Byways including All-American Roads, National Forest Scenic Byways (which pass through national forests), Bureau of Land Management Back Country Byways, as well as other scenic roads such as those designated as such by individual US states. The state of Oregon has specifically designated "Scenic Routes", perhaps other states have similar designations for some roads. For the West Coast and especially through Oregon and Washington and Northern California just driving Hwy 101 is great for scenery. It can be kind of slow going at times so be prepared for that. If you're looking for scenic drive options, this is pretty easy to zoom in on with Bing/Google/YouTube. Start a search with "overseas highway" and "17 mile drive" which are well known scenic routes in the US. The results will contain lists of scenic drives and sites about scenic drives and you can branch out form there. Well, you know your own likes and dislikes. Factor those into the planning. As a photographer and a lover of mountains, when I planned a 6 week holiday in the US I started with a big Ansel Adams book. I picked a bunch of favourite photos, and strung together as many as I thought I could tackle, on an itinerary that worked for me. And it turned out to be a fantastic holiday, covering diverse scenery from the northern AZ desert (Navajo Nation and the Grand Canyon of course) to Yellowstone. As I kept to a relatively low average speed I couldn't avoid soaking up the atmosphere on the stretches between the major events, and those stretches provided a lot of unexpected highlights. So, start by considering what you would like to see. For scenic drives, you're better off spending more time in the West. There's lots to like about the East Coast, but driving isn't one of them. Here's a 1-day loop worth doing in Seattle. As Strawberry said, you've got to do the national parks. Glacier, in particular, will blow your mind. Yellowstone is a few hours south, too. If I were you, I'd skip the east coast entirely, rent a car in Seattle and spend a week in each national park on your way to the Grand Canyon. Not the answer you're looking for? Browse other questions tagged usa driving scenic-routes or ask your own question. Is there an automated way to find tolls on a given US/Canadian driving route?